Search the name in Electoral List. Apply on line in English/ Hindi Language for new registration. Apply online for corrections, if any. User can view details of his Polling booth, Assembly Constituency and Parliamentary constituency. User can get the contact details of Booth Level officer, Electoral Registration Officer and other Election officer. Users can view audio visual short films to get educated about election processes. Audio Visual scripts are also available for getting to know about the polling processes. 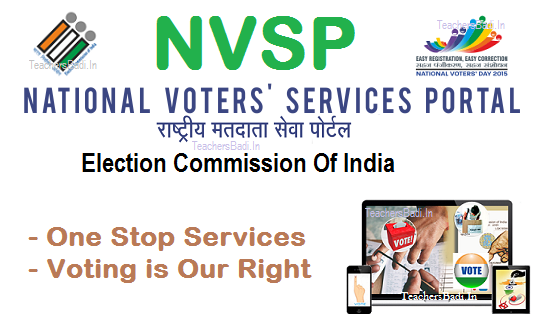 Users can watch a short educational film on Electronic Voting Machine(EVM) Year 2015 has been marked for “ easy registration and easy correction ” During this year, ECI will endeavour to put in efforts in providing all possible support services to electors with the help of IT tools. NVSP is one of them. How to Link Your EPIC Voter Card with Aadhar Card Number?